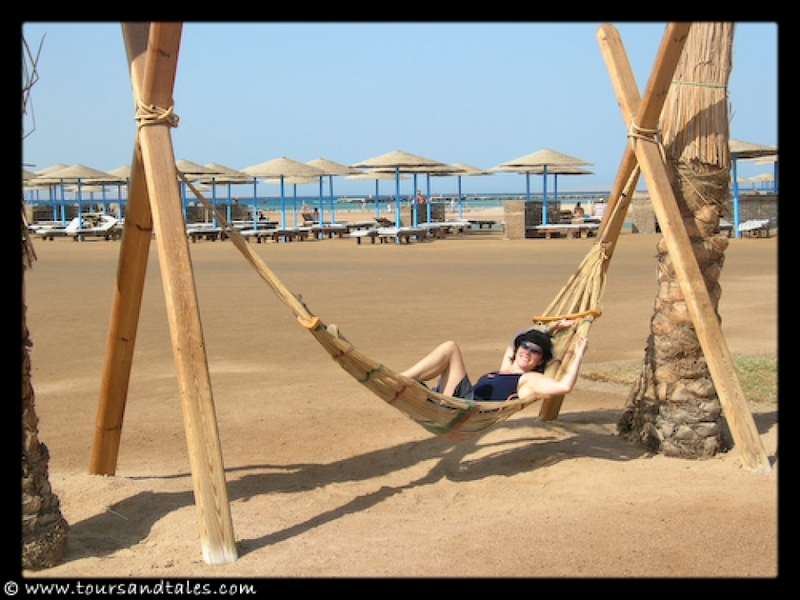 Our RYA sailing course was cancelled at the last minute, so we booked a last minute trip to Hurghada on the Red Sea in Egypt. We snorkelled, scuba dived, quad biked and visited Luxor including Valley of the Kings and Karnak Temple. This was the first “last-minute” all-in booking that we’ve made. And we can see what the fuss is about. We’d booked a week from 28/08 until 05/09 in 2006 through a Dutch online travel agency at the Hilton Hurghada Long Beach in Egypt. The Hilton has a five-star rating, but the rating system in Egypt isn’t the same as in other places. A five-star hotel in Egypt is more like a 3-star hotel in Europe. Our room was clean though and what we expected from a hotel room, but the bathroom was ready for botox. Sky International has got Dutch-speaking Egyptian guides who give all newcomers a briefing about Egypt and the various day tours that can be enjoyed. We’d agreed beforehand to enjoy a typical sun holiday, lying by the pool, soaking up the sun, and just relaxing. Well, after our briefing, it was impossible. We’re in Egypt right? Why not make the most of it? So we booked a day’s snorkelling, a refresher course in scuba diving (it had been five years since our last dive), quad biking in the desert and a bus trip to Luxor, to see the Valley of the Kings. And we’re very happy with our choices. The scuba diving was fab, with the second dive being better than the first (once the nerves had settled down). The visibility was amazing, but the water is much saltier than in South Africa (where we earned our stripes). My dry mouth missed the apple lollipops that our SA divemasters used to give us at the end of the dive. We did learn however that sucking a lime is excellent for curing sea-sickness! For a more relaxing time in the water, nothing beats snorkelling. You don’t have to worry about the bends or running out of time (or air) and you can swim at your own pace. Putting suntan lotion on regularly is essential. With the water trickling over your back, you don’t feel yourself burning. Oh yes, a tip … we’re avid fans of SPF 30 waterproof suntan lotion. But, on our second last day, we decided to try the suntan oil option. We’d figured that the lily-white skins that had taken on a golden hue were ready for a deeper tan. The bottle said it was 30 SPF, so we thought, “Cool!”. Not a good idea, we came home looking and feeling like boiled lobsters. Through our various day-trips, we visited different hotels and were quite shocked with the hygiene in some of them, especially their outdoor non-public ablution areas. I was really happy to see a camel up close and even ticked off my number 15 on the list of things I’d like to do before I die … Ride a camel in the desert. But if you get too close to the camels they can be like a bear with a sore head. It was less fun watching European ladies attempting to pull off ridiculously teeny bathing suits that the (Muslim) locals were scoffing at.